Perhaps not since the Civil War has America seen such a great divide between ideologies. 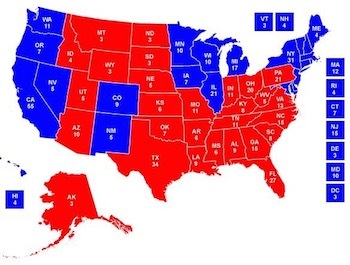 The electoral map provides a striking contrast. Unlike the 1860's, the division is not north against the south, butrather east/west against the heartland. We are truly a divided people. As the dark clouds of division and uncertainty swirl about our nation, many of us are alarmed. Perhaps none more than the children. They hear our somber whispers and they wonder about our adult conversations. They sense our concern. They see their heroes shaken by the news of the day and without the maturity to fully process the signs of the times. They worry, "What will I do if even my heroes are scared?!" Many years ago I wrote a poem entitled, "My God Is So Big!" It was written for just such a time as this; a time when children hear the whispers of their heroes and worry if there is anyone big enough to protect them. It is my prayer that, as the rifts between American citizens widen, you will use this poem to point your children toward the only Hero Who can truly keep them safe. Note: The following poem is best read with a few props. (Visual aids needed: A picture of the galaxy, a globe, and an atlas.) Each verse progresses through a series of locations that brings the reader closer and closer to home. To help your child relate, stop between verses and find the location on a map. When I look I can't miss Him. And in the Solar System. And made for me a world. In Him I am confident. I'm safe on a continent. It's in God we trust. He protects our great nation. A great place He did create. This great place is called a state. And I'm so itty bitty. And the name of my city. He goes with me when I roam. And even when at home. As the internet, smart phones, and social media force a smaller world upon our children, responsible parents find themselves working overtime to protect and prepare young ones for the regular assaults on their innocence. The reality of our world is one of violence and division. We cannot escape it, nor can we shelter our children completely from it. We can, however, celebrate the preeminence of a God Who knows us intimately and pays attention to us individually. We can teach our children to hope in Him, to take confidence in His greatness, and to trust in Him no matter where they might find themselves. Show them the reality of the words - "My God is so big!" Back to Top of "A Kingdom Divided"